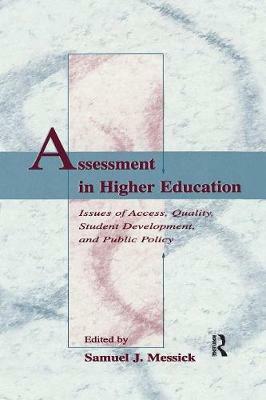 Assessment in Higher Education brings together in one place most of the major issues confronting higher education in the 1990s. These include enhancing student access, development, and success in higher education; transforming admissions testing to meet expanding educational needs; resolving the politics of accountability by assessing quality outcomes of higher education; assuring fair assessment responsive to human diversity; and facing the technological future of higher education. An integrative thread that weaves through all of these issues is the concept of equity, especially as it bears on social justice in education and on fairness in assessment. Another integrative thread is the role of computer and multimedia technology not only in improving the efficiency and power of all the functions of higher education assessment, but also in revolutionizing the delivery of higher education itself.